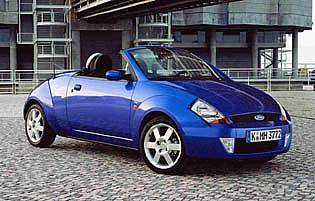 Just when the public was starting to think Ford had forgotten about its stunning Ka-based roadster concept from 1995, Ford finally put it on sale. They might be wishing they'd hurried it along a bit smarter as it proved an immediate hit even against such stiff competition as the Peugeot 206 CC, Mazda MX-5 and Vauxhall Tigra, capturing a significant portion of the increasingly valuable female market. The Streetka served a double function for Ford. 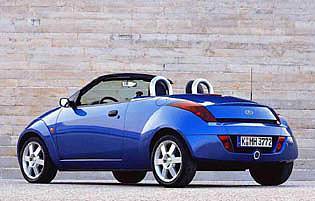 Not only did it add a convertible model to the company's totally tin-top roster, but it breathed new life into the already aged Ka, a car that is even more resistant to the ravages of years than Cliff Richard. Just like the Peter Pan of pop, the Streetka is scoffed at by hairy-chested macho men but loved by ladies who lunch and has the last laugh by selling in large numbers. As much a fashion accessory as a mode of transport it is cute enough to have character, cheap enough to be bought by a single girl about town (or as Mum's special treat by the family) and sensible enough to serve a useful purpose while it looks good. The solid underpinnings of the car have been stiffened and tweaked to release a wee bit more performance, but this is not a vehicle with any serious sporting pretensions. It's eminently chuckable, but the limitations of the 1.6-litre engine prevent even clog-footed drivers getting themselves into trouble. Around town it's at its best, darting in and out of traffic, nipping into tight parking spaces and performing neat little U-turns. On the motorway it gets a bit too talkative but is fun in short bursts. Ford's stylists have done an excellent job on the exterior providing an easy-to operate roof, some cute touches such as a rear foglight that looks like a sports exhaust (the real exhaust is a tiny tube tucked away out of sight) and chunky rollover hoops that serve to add some safety while performing the far more important task of looking cool. Inside, the genetic inheritance from the Ka is more obvious. The Luxury model does its best to hide the ancient layout and poor plastics by covering everything in leather, but it still shows through. Still, drivers are unlikely to spend much time looking around the cabin. They'll be too intent watching everyone else watching them as they buzz by. One of those rare cars that it is very difficult indeed to dislike, the Streetka mixes some tried and tested components with a successful restyling job. Importantly, it's fairly priced, too, undercutting most of its rivals by enough to make it a tempting option even if it's not quite as trendy as a Mini Convertible. Unlike some cars in its class, the Streetka's pricing is very fair. It's more expensive than a standard Ka, but the tauter chassis, better engine and folding roof justify the extra expense. Fuel economy is good, and one benefit of being based on the humble Ka is that parts and repair costs are among the cheapest. Insurance costs shouldn't be too bad, provided you can convince your insurer you will keep it in a secure garage. Resale values are good. Beneath the roof mechanism - where the rear seats would be in the standard Ka – is an additional storage space that Ford claims passes the all-important golf bag challenge. A smaller lockable box is between the two seats. However, that's about it and owners will need to make sure they don't leave valuables on display in the exposed trays. The manually operated fabric hood unclips folds away beneath the flush-fitting rear cover in a seven-step operation. That might sound onerous, but it only takes about thirty seconds and there's no fear that a complex folding roof mechanism will let you down just as the heavens open. The instrument cluster features an interlinked speed, rev and fuel counter with white on black graphics, but the limitations placed on Ford's designers by the Ka architecture are clear. The layout seems dated and driver information is pared down to the bare essentials. Ford's more modern treatment of instrumentation in cars such as the Focus and C-Max is vastly superior. Driver and passenger are placed in sport seats trimmed in black twill fabric in entry-level models, though how well these will stand up to frequent exposure to the open air is questionable. A far safer option is the leather of the Luxury model. 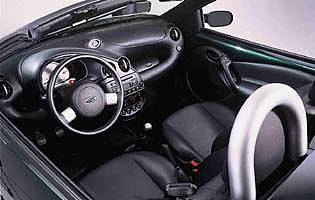 The chairs are positioned slightly lower than in the standard Ka for a suggestion of sportiness. Ride can be choppy at speed and the engine gets noisy when worked hard. An interior sensing alarm is fitted, but the fabric roof inevitably means that the Streetka's security is inferior to rivals with folding hard tops such as the Vauxhall Tigra, Daihatsu Copen and Peugeot 206 CC. A bespoke hardtop is available from Ford but is costly. A secure garage is pretty much essential for peace of mind at night and a robust steering lock would be a worthwhile investment - but check there's somewhere to stow it when not in use. Keycoded anti-theft audio equipment is an optional extra. Safety specification in the Streetka has been enhanced to allay the obvious fears that accompany roadster ownership. As well as the important rollover hoops behind the seats, there are only dual front airbags as standard with the further option of side airbags. A four-channel anti-lock brake system with electronic brake force distribution is also aboard to regulate the front disc and rear drum brakes. It doesn't have the sublime balance of the Mazda MX-5 or the superquick responses of the Smart Roadster, but the Streetka is fun without being either quick or keen. 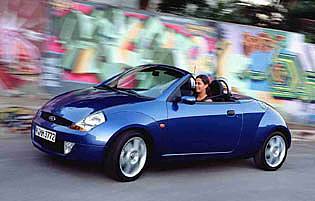 Ford's spanner-wielding efforts have tightened the standard Ka chassis somewhat but it still lacks rigidity. Even the modest power output provided by the 1.6-litre engine can cause a shudder or two through fast or sharp corners. Yet on a sunny summer's day, cruising along at a modest speed in a Streetka is undeniably great fun. With just two seats, the Streetka's main familial role is as a piece of fun frippery for a hardworking Mum. Family shopping trips and after-school taxi duties are off the agenda, but it's perfect for popping down to the gym to work off all that stress. A young girl about town or student with well-heeled parents would probably love a Streetka as an entree into the world of motoring. But think twice before handing over the cash - don't you really need a bigger boot and a more secure roof if it's not going to be garaged? Second-hand examples remain rare. While the standard Ka could hardly be described as trendy, it remains endearing. The Streetka builds on this goodwill with a sharper design (in fact only the bonnet and headlamps are shared with the Ka) and some fashionable accessories. Only women look 'right' behind the wheel though. On the rare occasions that you do see a man driving one, you can bet he'll do his best to avoid eye contact. Two doors, two seats, you work out the rest. If you want to show off, it is possible to vault into position, Dukes Of Hazzard style, but such a course of action is not recommended. The lower-mounted seats need a little bit of care to settle into but are very comfortable. Tall drivers may find the top of the windscreen a little too close to their heads. All soft-tops deserve a good stereo to drown out road and rain noise with the top up or just to treat passers-by to your impeccable taste in music on summer days. The Streetka comes with a reasonable radio and CD player with four integrated loudspeakers. The more advanced 6006 system with in-dash six-CD player is a popular option. Predominantly black, the cabin has a few brighter touches like the aluminium ball gear-knob (a throwback to the late lamented Puma) and the aluminium framing of the oval clock which once looked 'so right' but now looks rather dated. Leather upholstery helps to limit the disappointment of the interior. Bright, vibrant exterior colours suit the car's cartoonish looks best – even nail polish pink isn't unheard of. The standard Ka is one of the easiest cars to park. If anything, the better all-round visibility of the Streetka (with top down) makes it an even more straightforward proposition. Though not as light as, say, the Fiat Panda's, steering is precise and responsive at low speeds. Judging distances fore and aft is easy, as there are virtually no overhangs to take into account. Standard wheels are of 16-inches, but the spare slung under the rear of the Streetka is a 14-inch one. There's just the one engine, a 1.6-litre (94bhp) Duratec unit. With just 8 valves, you might think it is rather crude but it is Euro IV compliant and strikes a decent balance between economy and the merest hint of sportiness. Two grades - Streetka and Streeetka Luxury with the latter worth the extra. It's worth keeping an eye out for periodic special edition models, such as the Winter StreetKa, which offer extra kit.